One of the most versatile white fish recipes you could find. It's very quick to cook - just five minutes in a frying pan on the stove top, on a grill or under the broiler (grill). 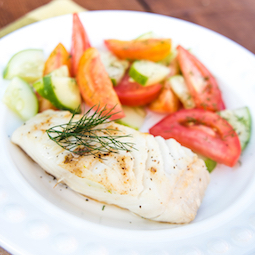 Super simple to make - have your salad ready before you start to cook the fish. 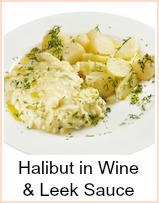 If you like, you can have some boiled buttered new potatoes - try some herb butter dotted on for a change. When you're making the croutons, set a timer - 10 minutes goes very quickly and you don't want a charcoal offering. This is a really simple way of making garlic croutons which you can make in quantity and store in a jar for topping off salads and soups. Heat the oven to 200C Gas Mark 6. Put 1 tbspn oil in a bowl and add one of the garlic cloves or some garlic powder/salt. Tip in the bread cubes and mix thoroughly to coat. Put the bread on a baking tray and cook for about 10 minutes - the croutons should be crisp and golden by then. Put 2 tbspns of olive oil, the wine vinegar and garlic in a screw top jar and shake to mix. Chop up the salad ingredients and put in a bowl, then pour the dressing over. 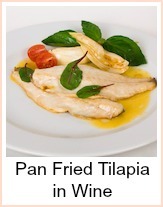 Heat up a frying pan, brush with oil and when it's hot, add the cod fillets. Cook for about 4 minutes, then turn and cook another minute or so until the fish is firm to the touch. Serve with the salad topped with croutons and the fish. 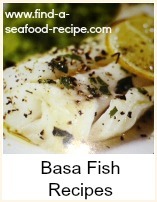 You can use cod, haddock, pollack, tilapia, basa, halibut, turbot - anything you like. It can be fresh or frozen. It will be cooked when it's firm to the touch and flakes easily. A really easy salad topped with warm cod and croutons. Lovely for a summer outdoor meal, cook on the grill or barbecue or serve indoors. A great way of making garlic croutons as well which you can store in a jar.